Katrin Hafner and Peter Gray (Pacific Northwest Region) were busy during the month of June installing three Deep Drilled Braced Monuments (DDBM) in Washington state. Assisted by Karl Feaux and Steve Borenstein of the PBO Boulder office, all three sites were finished in nine days and have been transmitting data through VSAT or VSAT/radio combination. 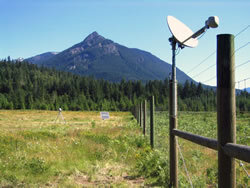 The first DDBM station (Lind, WA; station P020; DryLndRsh_WA2004) was installed on the Washington State University Dryland Research Station. The Research Station is funded by an endowment that was created in 1996 to fund research of low rainfall areas (less than 12" annual precipitation). The third station was installed at the Packwood Community Ball Field in Packwood, WA (station P432; PackwoodF_WA2004), owned by the Lewis County Public Utility District. Drilling for all three sites was done by Layne-Christensen (Tacoma, WA) using both a hollow-stem auger and a percussion hammer rig.